What Does Code P0402 Mean? A malfunctioning EGR system will cause several codes such as P0400 or P0401-P0409 to be displayed. Often a P040x code is caused by a blockage in the EGR system and is not caused by a failed component. MAP sensor – if the EGR valve is vacuum controlled the PCM will read changes in the MAP sensor output in response to exhaust gas recirculation. The voltage from the MAP should increase when the EGR valve is opened. EGR Valve – recirculates exhaust gas through the intake manifold. Why recirculate? Recirculation of the exhaust gas is primarily done to prevent NOx emissions. High NOx emissions during driving can indicate an EGR problem. 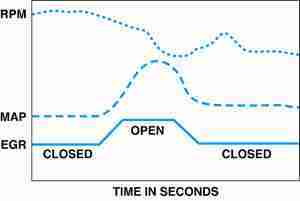 Recirculation reduces combustion temperatures below the reaction temperature of Nitrogen and Oxygen. A secondary benefit of recirculation is improved fuel economy since fuel in vapor form is extremely efficient to burn. Recirculation should not occur at idle. If at idle, the recirculation of exhaust gas can lean out the engine – killing it. EGR valves have pintles that prevent exhaust gas from entering the manifold. Some cars vary the vacuum pressure instead of the EGR solenoid duty cycle to control exhaust gas recirculation. These systems have on/off EGR solenoids. The brains of the EGR system. It controls the exhaust gas valve. When open the EGR solenoid supplies vacuum from the intake manifold to the EGR valve. 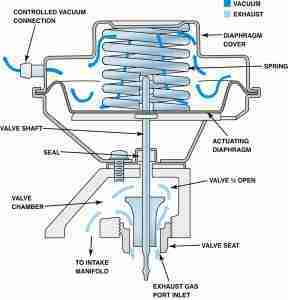 Vacuum causes the EGR valve pintle to lift off the valve seat which allows exhaust gases to enter the intake manifold. Disabled during idle and wide open throttle. In GM cars the solenoid is disabled in Park or Neutral. In an EGR system there is a pipe which comes off the exhaust manifold. The first EGR system tests you should perform are EGR idle tests. Both tests involve leaning the engine at idle by allowing exhaust gas to enter the engine through the EGR system. Apply vacuum to the EGR valve at idle. This test will determine if there is a blockage in the EGR valve/system. If there is a blockage the engine will NOT die when the vacuum is applied to the EGR valve at idle. The compete EGR system can be tested at idle by disconnecting the car’s electrical connection from the EGR solenoid and replacing it with an external 12 volts to the EGR solenoid. 12 Volts will activate the EGR solenoid, causing full recirculation of the exhaust gases to the engine. 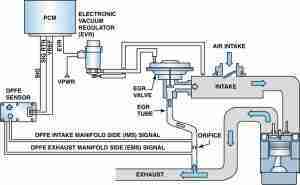 At idle full recirculation of the exhaust gases should kill the engine. Your EGR system is mechanically functioning properly if the engine dies because the solenoid has activated the valve and exhaust gases have entered the engine intake. Even if you are able to kill the engine at idle there can be PCM signal problems. Once you have eliminated mechanical malfunction with the above EGR idle tests, you should test the PCM with a scan tool. If the engine does not die, either (1) the EGR valve diaphragm is not opening in which case you will need a new EGR valve or (2) the EGR valve passageways are clogged in which case you can clean the passageways and retest the valve. Check that the vacuum holds. If there is a leak in the vacuum line the vacuum will not hold. NOTE: If your EGR valve passes the above two tests but you still have an EGR problem you should test the PCM signals to the EGR valve. With a scan tool you can tell the PCM to open the EGR valve at idle and verify that the engine dies. 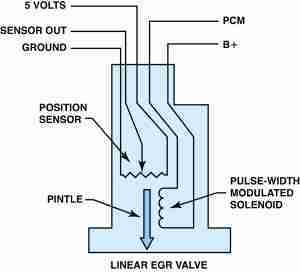 The EGR solenoid testing is similar to the EGR valve. You will want to check the vacuum integrity and electrical response of the solenoid.